From the archives: IB World magazine regularly highlights graduates of the IB Diploma Programme. Shanta Devarajan, International School of Geneva, was featured in January 2013 for his role at the World Bank. As one of the first people in the world to study the IB Diploma Programme, at the International School of Geneva in 1971, you would expect Shanta Devarajan to be highly principled. What’s particularly inspiring is just how he has put those principles into practice, working to end extreme poverty in some of the most deprived parts of the world. 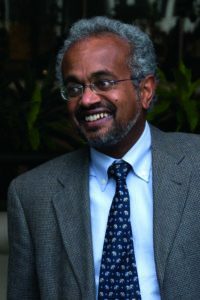 Shanta joined the World Bank in 1991 after receiving his undergraduate degree from Princeton and his Ph.D. from the University of California, Berkeley. He is now the bank’s Chief Economist in Africa, which brings him a set of seemingly intractable challenges. “We’re trying to end poverty in a sustainable way,” says Shanta. Poverty reduction was not always Shanta’s focus in the field of economics. Shanta Devarajan attended the International School of Geneva during the founding years of the IB diploma. By the late 1990s he had written or co-authored a wealth of academic publications on subjects spanning economics, trade policy and natural resources. Despite his success, he felt that he could do more. “Something in me snapped,” he says. “I felt so privileged – I’d gone to the best schools and had exciting and rewarding jobs. It was time for me to give back a bit. I decided to dedicate the rest of my career to ending poverty. Fortunately, I’m in a position at the World Bank where I can make some change in Africa.” Shanta admits that the academic challenge still excites him: “It’s that combination of dealing with an intellectual problem and doing something rewarding. You’re helping people in the world who need the most help. Having worked most of my professional life in Africa I feel very at home there.” Shanta’s experience studying at the United Nations International School in New York and later in Geneva, prepared him well for his career: “It’s easy for me to work in this area. When I moved from a multinational classroom to a multinational office, there was almost no change.” In Geneva, Shanta was one of the first students chosen to study the Diploma Programme, but he wasn’t worried. “There was a prestige thing – you had to be nominated to take the IB. So it was only students who the school felt would do well,” he says. Shanta has plenty of good memories from school. “It was the best time of my life,” he says. “We had an English class that was full of debate. We’d come in and just go at each other about a book. We were encouraged to think critically and script our arguments. It was a great experience for lat er life.” Not only did the IB give Shanta early experience in critical thinking, it piqued his interest in a range of subjects. This story originally appeared in the January 2013 issue of IB World magazine. Are you an IB graduate? Join the IB Alumni Network by visiting www.ibo.org/alumni.